This is one of the easiest and tastiest healthy salmon recipes you will find. It combines the Thai flavors of ginger, cilantro, red chilies, fish sauce and a bit of sugar in an easy steamed salmon recipe that will amaze you. This fantastic recipe comes from a cookbook called Complete Book of Thai Cooking: Over 200 Delicious Recipes . Arrange salmon in a single layer in a shallow baking dish. In a bowl, combine ginger, cilantro stems, garlic, chilies, lime juice, fish sauce and sugar. Spoon mixture over fillets. Cover dish with foil and seal edges. Bake in a for 8 to 10 minutes, or until fish is opaque and flakes easily with a fork. For a healthier diabetic diet recipe, omit the sugar or replace it with coconut sugar. The coconut sugar would work perfectly in this recipe and is much easier on blood sugar than regular sugar. The author of the cookbook this recipe comes from, Linda Stephen, has travelled extensively through Thailand and brings both her expertise and love for the cuisine to the recipes in this cookbook. The fragrance will hit you as soon as you open the packet. Fresh and spicy, it is perfect for a light dinner with a bit of rice and some steamed vegetables. 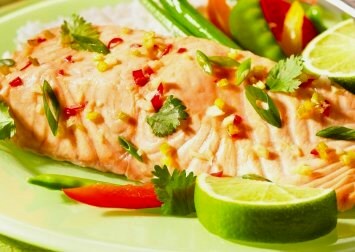 Look here for more delicious and healthy salmon recipes.